SAP has provided the functionality of plant abroad where the plants can be created outside the company code. Please refer to the example below, the legal entity or the company code in created in Belgium and the plant under it are created in France and Switzerland. There are many reasons why an organization decide to go ahead plant abroad. One of the classic example is when an organization have branches outside the company code country, so instead of creating company code in every country the organization may decide just to go ahead with plants. Moreover, the organization may be selling to consumers (B2C) in other EU countries. If they sell goods and send to consumers in another EU country, they need to register there and charge VAT at the rate applicable in that country. However, if they were selling to business (B2B), they do not charge VAT – if the customer has a valid VAT number. The customer in this case has to account for the VAT on the transaction as if it had sold the goods himself, at the applicable rate in customer country. Normally, he will later be able to deduct this amount. Therefore, plant broad is relevant to B2C sales and it’s not required for B2B sales in other EU country. We’ll use the above example to understand how the plant abroad works. Let’s assume that an organization in Belgium is selling to a customer in France. The customer is consumer without a VAT registration number. Therefore, the Belgium organization have to be registered in France and it should charge VAT at the French rate. In the physical invoice printout to the customer, the French VAT number should be printed. The customer sales order for the French customer. This customer sales order in created in Belgium company code( 1200) with the French plant( 1202). 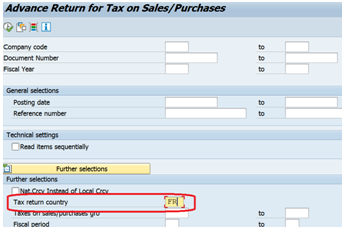 The tax departure country is modified to “FR-France” in the sales order. Using MWST pricing conditions, the output tax code pulled is with French tax rate. Although this tax code is created in Belgium company code, the reporting country is France (activating plant abroad allow reporting country in tax code FTXP settings). Tax departure country helps to populate the correct VAT number in the customer invoice. The standard print program uses this field to get the departure country VAT instead of company code VAT registration number. Furthermore, you maintain the various VAT number in the customizing setting as below. Tax codes at the rate applicable for France may be selected using the departure country and destination country combination as below. The tax code is created in Belgium but the reporting country is France. This field is activate along with activation of plant abroad. Reporting country is used for filing tax returns or getting tax report for France. Reports like “S_ALR_87012357 – Advance Return for Tax on Sales/Pur” have the “tax return field” which can be used for VAT tax reporting in France. 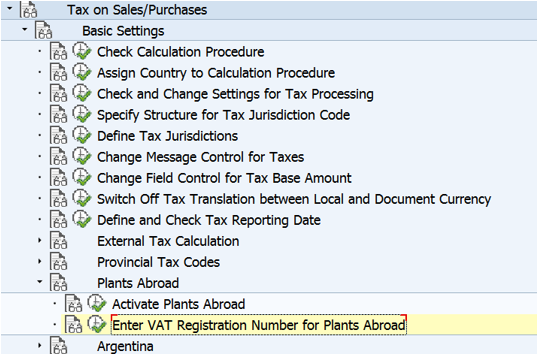 Another intra-company invoice is required too for VAT and intra-stat reporting called plant abroad invoice. 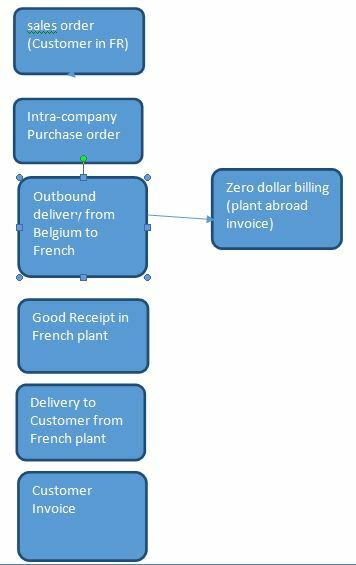 This invoice is created from the outbound (replenishment) delivery from sending plant to receiving plant. Although both plants belongs to the same company or same legal entity, therefore there shouldn’t be any invoices between them. This invoice is fictitious in nature and just used for VAT and intra-stat reporting and doesn’t have much meaning in terms of FI entry. SAP have provided a billing type “ WIA” with the pricing procedure RVWIA1which should be used here. Now, let understand the pricing procedure for these invoices. It has three tax conditions -WIA3, WIA2 & WIA1. It you refer to the screen print or spreadsheet below, WIA2 is for the departure country (Belgium) which is normally at 0% vat code. It’s used for reporting in departure country indicating that this was sold outside Belgium but within EU therefore, 0 % output VAT was applied. 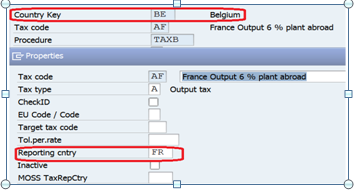 Furthermore, for the destination country( France), there are two tax conditions WIA3 for output and WIA1 for input. Normally the tax percentages are same so that they negate each other. This mechanisms called VAT reverse charging. Plant abroad solution was designed by SAP for outside plants within EU, but it can tweaked to work for plants outside EU too. It’s may be essentially the same as within EU with one exception that VAT reverse charging is not applicable for plants outside EU. The destination country will have to apply input tax (WIA1) which they can get credit of. Therefore, if you compare with above EU pricing procedure, WIA3 is missing. The output tax in departure country is the same. Intra-stat is the report for collecting information of good movement between EU countries. Every VAT registered organization is required to declare value of arrivals and dispatches within EU if exceed threshold limit. Please refer to threshold limit here http://www.vatlive.com/eu-vat-rules/eu-vat-returns/intrastat-reporting-thresholds/. Now we’ll go through the above example of Belgium to France to review this report both for dispatches and arrivals. As Belgium is sending good to France, Tcode “VE02” will give us information of dispatches. Here the country of destination is France and country for declaration is Belgium. And it provides information of value of good dispatched, weight, VAT registration # of receiving plant. Similarly, in the France, intra-stat reporting is required for arrivals. 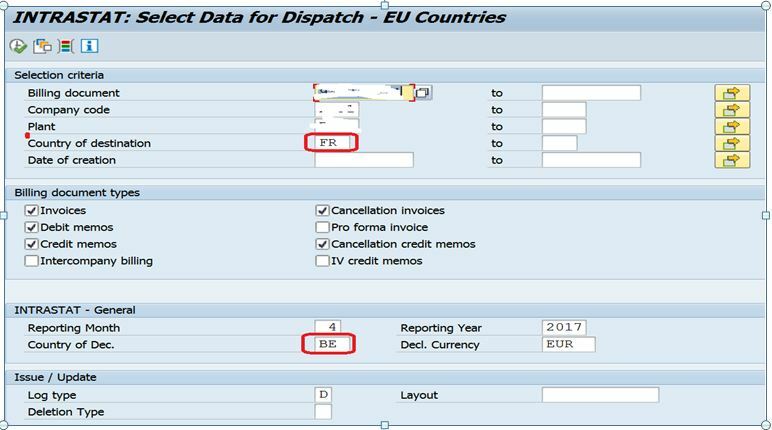 The TCode for it is “MEIS”, the reporting country is France, and it provides information of dispatching country and VAT # of dispatching organization apart from value , weight etc. One of the best summaries I have found – thanks.